Living Science Solutions for Class 7 Science Chapter 6 Flow Of Heat are provided here with simple step-by-step explanations. These solutions for Flow Of Heat are extremely popular among class 7 students for Science Flow Of Heat Solutions come handy for quickly completing your homework and preparing for exams. All questions and answers from the Living Science Book of class 7 Science Chapter 6 are provided here for you for free. You will also love the ad-free experience on Meritnation’s Living Science Solutions. All Living Science Solutions for class 7 Science are prepared by experts and are 100% accurate. In conduction, the molecules vibrate and hit each other to transfer the heat energy between them. The molecules need not to travel from one end to other. Therefore, it is only possible in solids in which the molecules do not move but vibrate on heating. In which method of transfer of heat do the molecules travel from the hot the cold protion? In the convection method, molecules travel from the hotter region to the colder region. The case is the same when water is heated. Because, if handles conduct heat from the utensils, they will become and make it impossible for us to hold the utensils. In the process of convection, molecules move from a hotter place to a colder region. Therefore, convection is impossible in solids because the molecules are rigid and vibrate when heated. In liquids and gases, molecules are comparatively less rigid and can move easily, thereby making convection possible in them. By which mode is heat transferred in solids? In solids, heat is transferred through the process of conduction. This is because the molecules in solids are rigid and only vibrate on heating rather than moving from one place to the other. The vibrating molecules of the hotter region hit those molecules in the colder region, causing the transfer of heat. Are most metals good or bad conductors of heat? Most metals are good conductors of heat. This is because the molecules in metals vibrate and hit the nearby molecules to transfer the heat energy, rather than moving from one place to the other. Gases are insulators of heat. True of false? Gases are good insulators of heat because their molecules are too loosely bonded to conduct heat between them. By which mode is heat transferred in liquids? Heat transfer in liquids takes place through the process of convection. In this case, the molecules of liquids move from one place to other to transfer the heat energy. Name a liquids which is a good conductor of heat. Mercury is a liquid which is a good conductor of heat. It is an exception, as all liquids are good insulator of heat. When you heat water in a pan, by which mode does most of the heat travel in water-conduction, convection or radiation? When we heat water in a pan, the heat travels throughout the water through the process of convection. This is because the water at the bottom expands on heating, becomes lighter and moves upwards. The heated molecules start moving fast and collide with the cooler molecules to transfer their heat energy into them. In which mode of transfer of heat does the medium not get heated up? Radiation is a process in which the molecules don't transfer or carry heat from the hotter to colder regions, but the material itself radiates the heat energy. Therefore, it requires no medium to transfer the heat. Higher the temperature of the body, the more it radiates heat. 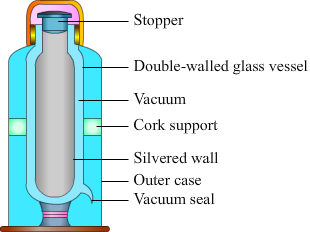 A thermos flask consists of a double-walled glass vessel with the space between them filled with air, which is a bad conductor of heat. True of flase? In a thermos flask, the space between the two glass walls is empty. This vacuum prevents heat loss through conduction and convention, as there is no medium present to transfer the heat by these two processes. Radiant heat falling on a body is partly absorbed and partly reflected. Some of it may also get transmitted. Some part of the radiation are absorbed by the object, while some will strike its surface and reflect like a ball bouncing back on striking a wall. The remaining part of the radiation will pass through the object like a light passing through a glass, i.e., transmitted. Two objects at the same temperature-one bigger than the other-are placed in contact. Will heat be transferred from one object to another? Explain. For conduction of heat from one object to other, it must satisfy two conditions. Firstly, the objects should be in contact with each other. Secondly, they should have different temperature. But in this case, only the first condition is satisfied; hence, the heat energy will not be transferred. In a room it is best to place a room heater on the floor but an air conditioner near the ceiling. Why? A room heater warms the air, thereby expanding it and making it light. This warm air then moves upwards and spreads across the room. Thus, a room heater must be placed on the floor to heat up the room in an effective manner. An air conditioner should be placed near the ceiling because it cools the air near the ceiling, thereby making it heavier enough to move downwards and cool the entire room. Why are cloudy nights warmer than clear nights? Cloudy nights are warmer than clear nights because clouds prevent the radiating heat from the Earth to escape into the outer space. How do the feathers of a bird protect it from the cold? Feathers of birds have spaces in them which are filled with air. This mechanism acts as an insulator of heat and protects the birds from the cold. Draw a neat labelled diagram of a thermos flask. How does it prevent transfer of heat by conduction, convection or radiation? Thermos flask consists of double glass or metal walls with a space in between them. Air is completely sucked out of this space, and after that the walls are sealed at the neck or at the bottom of the flask. This vacuum is created to prevent heat loss due to conduction and convection, as both these methods require a medium to transfer heat. Then, the walls are silvered. This silver polish prevents the heat loss through radiation, as heat from inside the flask is radiated back to it and the external heat is reflected back to the surrounding. Finally, the vessel is put inside a metallic case with a plastic or cork support on both sides so as to protect the glass from breaking. At last, the mouth of the vessel is closed by a stopper made from an insulating material like plastic or cork. Two test tubes full of water are heated-one from below and the other near the top. In which case will the water heat up faster and why? The test tube which is heated from below will heat up faster. When we heat water from below, the molecules at the bottom of the water start heating and expanding due to which they become light and move upwards. On moving upwards, they transfer the heat energy to other molecules. After transferring their energy, they contract and return to the bottom again. This cycle continues still the entire water gets heated through the convection mode. If water is heated from above, the heated molecules at the top will change their state to form steam, as they can hardly transfer the heat energy to the bottom layer due to the convection currents. In water, heat travels up much faster than it travels down. Explain. When we heat water from below, the molecules at the lower layer of the water start heating and expanding due to which they become light and move upwards. On moving upwards, they transfer the heat energy to other molecules. After transferring their energy, they contract and return to the bottom again. This cycle continues still the entire water gets heated-up. However, if the water is heated from above, the heated molecules at the upper layer will either change their state to form steam, or remain in their liquid state to transfer heat to the nearby molecules. Thus, heat takes much time to travel downwards than upwards. In places with hot climate, it is advised that the outer walls of houses be painted white. Explain why? The colour white reflects the radiated heat to the surroundings; therefore, the outer walls of the houses, in the hotter regions of the Earth, are painted in white to keep them cool.